Hallie comes from a tight-knit family, so when considering all the DIS housing options, she prioritized bringing that family feeling abroad with her. As it turns out, her decision was a good one — and today she has become a part of the everyday routine of a family of five. Hallie makes pancakes with her host sister. Illustration by current student Molly, Scripps College. 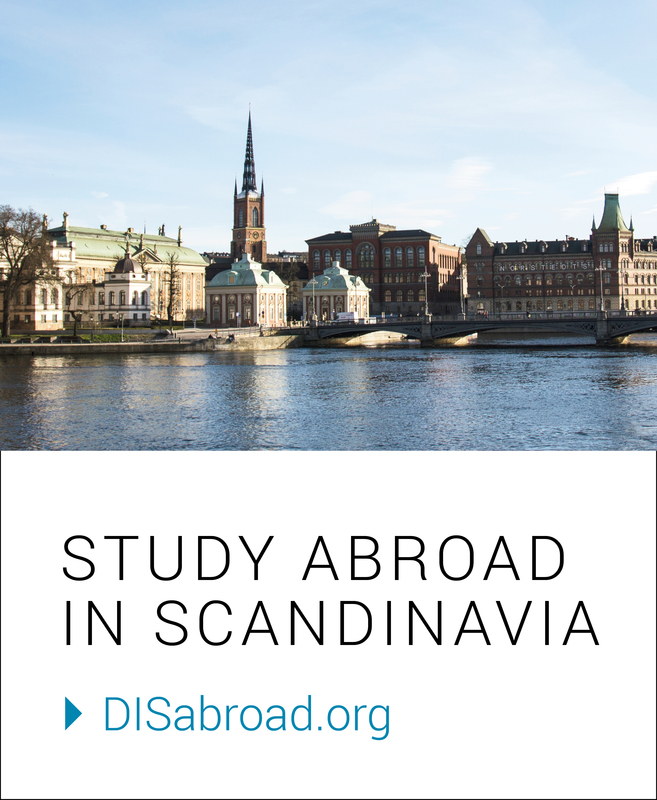 DIS: Tell us about your Homestay. Who are your hosts and what makes them special to you? Hallie F.: My Homestay is in Søborg, which is about 30 minutes north of Copenhagen, and honestly, it is the best part of being abroad. As soon as I got to my new house, I felt right at home. The more we get to know each other, the more I love being around them. My host parents are Katrine and Jesper. They both work in the city. He works for a startup within the field of computer science, and she works for the Ministry of Finance. They remind me so much of my own parents and make me feel so welcome and comfortable. The kids are a perfect age mix. The youngest, Eva, is 7, so she is still cute and little and we play games and jump on the trampoline. She doesn’t speak English so it has been interesting trying to figure out other ways to communicate with her, through mimicking and thumbs up or down. The middle son, David, is 12, and although he has taken a little longer to warm up, we have found common ground cooking dinner together and watching soccer games. He is very funny and I have enjoyed getting to see him become more comfortable with me. The oldest daughter Marie is 14, and wise beyond her years. She is at the age that we can just be friends, so we Snapchat during the day and do grocery shopping together, and watch TV and listen to music. We have just started watching The Voice (U.S. edition) together at night while we drink tea and it is usually the best part of my day. She has been one of my favorite parts of this experience, and I am so lucky to be in this family. HF: I really wanted to have that support system since everything was going to be so new to me. I also knew that it would be an environment in which I would be the most comfortable since I prefer to be in a more relaxed setting. Also, since we are in class primarily with Americans, I thought this would be a perfect way to engage with Danish culture. It is also really nice having ‘parents’ that are able to help you, especially at the beginning when things are so new. My first official day at DIS, my host mom rode the bus in with me and dropped me off at the meeting point. I would have been so flustered without her and felt so much more comfortable with someone showing me where to go. DIS: What is the biggest obstacle so far you have discovered between your Homestay here and your family back at home? HF: Learning to speak up for myself. When there is a small problem, or I just want something at the grocery store, it sometimes feels as though I could be imposing on my family. However, Danes especially are very upfront about things, and if you need something, chances are if you just ask they will not be offended and will be more than happy to get it for you or help you figure out a way to get it yourself. HF: We do little things like help get dinner ready, go to the store, or just be together. Playing games has also been a really good way to interact with the youngest one, who can’t really talk to me. I often sit down with the parents and watch the news or something else that is on TV. Although we aren’t always talking, and I don’t understand any of the news because it’s in Danish, just being in each other’s presence is really rewarding. We also went to the F.C. København game together which was really fun and provided us with a good environment to come together with a specific goal. It’s super important to be really present the first couple of weeks so that you do build a good relationship and have a baseline, especially because things start to get more hectic as the semester continues and you might not have as much leisure time to spend together. Eva always comes and asks me, “do you want to jump?” (her only English), asking if I want to go jump on the trampoline with her. I love seeing her pure enjoyment and we can just laugh and play together. Also, every night she rates the dinner that we had by giving me a thumbs up, down, or in the middle. It is funny to see her reaction when she doesn’t like the meal. With David, he has helped me learn some Danish, and now has phrases he always says to me. He left to go on a school trip for the week, and we joked about how tragic it would be that he would not be home on Wednesday to cook for us (he cooks dinner on Wednesday nights) and how we would all starve without him. I love seeing how proud he is of the dinners that he cooks. Marie and I have spent the most time together, and the best part is that we are starting to develop inside jokes and now we’re always laughing together. We watch tv, she tells me about problems at school, and we do homework in my room together. Some of my funniest moments with her are when my host mom does something funny (unintentionally, as moms do) and Marie and I just cannot stop laughing over it. These tend to be running jokes for weeks to come. With my host parents, we have started watching a Danish version of ‘Dancing With the Stars’, and they started saying that they were going to go on the show together. While neither of them is famous nor do they dance, they said this was what was going to make them so iconic, that they would be the first couple to not have a professional dancer or be famous. The whole family got a good laugh out of that one. One Sunday we had an afternoon of hygge and we played games and made pancakes. There was an initial shock because these pancakes are NOT American pancakes, instead, they are crepes that you fill with ice cream and jam. Marie, Eva, and I spent the morning making them, and we all had so much fun spending the day hanging out together. DIS: Tell us one thing you would recommend to a future student considering choosing a Homestay? HF: I would say to definitely 100% do a Homestay. I really feel that it is a once in a lifetime experience. The potential to create a connection that can last a lifetime is something so valuable. Getting to know another family, having ‘parents’ that can help you and teach you all about living in Copenhagen, playing with new siblings, and spending time all together is so comforting and rewarding. Also, being in a host family exposes you to parts of Copenhagen, along with the rest of Denmark that you would otherwise miss out on. Last weekend, Marie had to go to an open house at an Efterskole (optional year of 10th-grade boarding school) and so we drove 45 minutes away and turned it into a family trip and visited Stevns Klint. It is a UNESCO World Heritage site and has some big geological significance. I would have never gone to this place if I hadn’t been with my host family. My Homestay has been the best part of my abroad experience so far and makes me want to stay in Copenhagen as much as possible for the next 4 months. (Also, having delicious dinners every night is a wonderful perk). Are you thinking about living in a Homestay for your semester with DIS?